Vacation In Yosemite | Family Gatherings! | Spacious, Private! | Great location! Historic logging railroad is your neighbor! Conveniently located on Highway 41 and just minutes from Yosemite's southern entrance, our spacious family-friendly modern mountain home offers comfort and privacy, a unique connection to local history and even the nostalgic sounds of the nearby Yosemite Mountain Sugar Pine Railroad. Our 2800 square-foot mountain home borrows from the Swiss Chalet style using local, authentic century-old trestle wood beams. The open architecture offers your extended family or friends all the living space you will need, plus the modern comforts you would expect, for that unforgettable trip to the Yosemite area. For the most accurate, up-to-date details be sure to visit our website (look for "Visit our Website!" on this page). You'll find more helpful information, more pictures, and details on our rates and policies. Our availability calendar is also there for your vacation planning convenience. It's best to contact us by email but you can also call and leave a message if you prefer. When checking our calendar remember that we normally need a full calendar day between groups in order to prepare the house. We look forward to hearing from you! I had hiked (striked out) It was really fun we hiked we had fun hiking there was no bats living in the living room (drawing of a bat with an X across it) The cabin was awesome!!! It was a good vacation!!! FROM DARIN Hi! I didn't see any bats living here. The dumb waiter is cool. Bye. Cool place. Background: Iowa boy to wed CA girl---and boy's extended family needs a more affordable & comfortable lodging option than the nearby lodge/wedding site. We has stayed at Trestlewood once before (the meet-the-inlaws trip) and understood its potential. Our stay for the wedding was everything we'd hoped for and more, although we did push the lodging options almost to capacity. Trestlewood is relatively easy to find for first-timers, its layout facilitates as much bonding and/or privacy as desired, the kitchen works great and the views are outstanding. David's pricing structure is logical and fair, and he was 100% professional and consistent in supporting us. 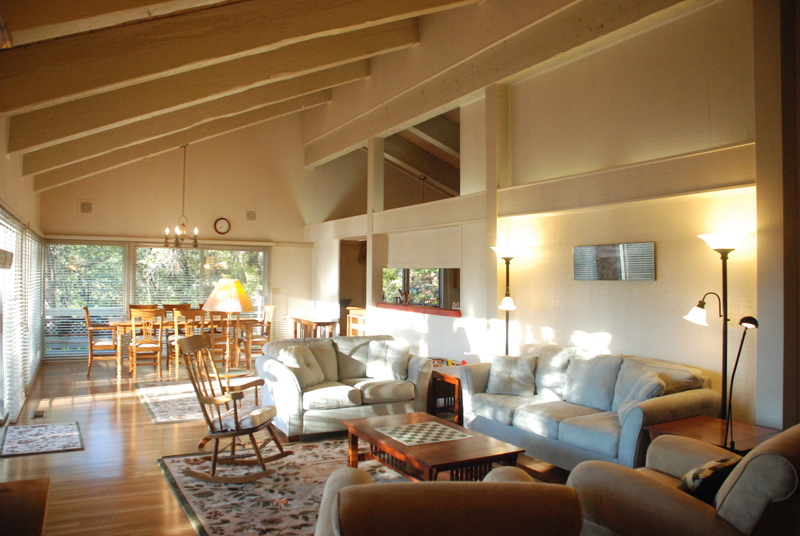 For another gathering in the West, we'd have no reservations about a return stay at Trestlewood-----tw Recommended for: Families with Young Children, Sightseeing, Adventure Seekers, Age 55+, Romantic Getaway, Families with Teenagers. We stayed at Trestlewood Chalet for our daughter's nearby campground wedding (someone had to have a shower!). As one who hosts vacation rental property herself, I was exceedingly pleased by how well organized, maintained, and appointed the home was. What we needed was there, easy to find, all in great shape. Plus, the home was beautiful, the outside gardens a treat, as well as the decks. We were 6 adults, with plenty of baths and bedrooms to accommodate us. The owners were excellent communicators and very conscientious. A total pleasure. Recommended for: Families with Young Children, Girls Getaway, Age 55+, Families with Teenagers. We have stayed at the Logger’s Retreat and always loved it. Since it was not available this time, we booked the Trestlewood Chalet. It was great for our party of 11 family members and friends: one couple, one single adult, one couple with two small boys, and one couple + two older sons. The bedroom and bathroom situation was perfect for our group. The kitchen and pantry, as with the Logger's Retreat, were well-stocked with everything we needed in the way of equipment and supplies. The bathrooms were also well supplied. The deck was bigger than at the LR, so if you have a large group eating outdoors, Trestlewood is ideal. The house was actually built using a former railroad trestle, and the huge beams are a lovely echo of the Sugar Pine Railroad down below. There is also a Thomas the Tank railroad set up on its own table near the dining table, which was fun for the little guys, and others, too. The small rechargeable vacuum cleaner was another big hit with the smaller guests. We rode bikes in the valley this time, and it was really beautiful. If you need to rent any bikes, including a parent's with a trailer, they are available at the Yosemite Lodge and at Currie Village. The house is large and everyone could spread out and do what they liked, but we were all together, too. The dining table is good for a large group for eating and playing games, as well as being a nice surface for making cookies, etc. Highly recommended for a group. Recommended for: Families with Young Children, Pet-friendly, Sightseeing, Girls Getaway, Tourists without a Car, Adventure Seekers, Age 55+, Romantic Getaway, Families with Teenagers. I highly recommend staying at the Trestlewood Chalet. You cannot beat the comfort and spaciousness of this house to any hotel nearby. It does live up to it's description. We were very pleased to find the house meticulously maintained and very comfortable. We were 3 couples spending 3 nights at the Trestlewood Chalet. We enjoyed using the fully equipped kitchen to make breakfast and dinner BBQ's. It's Location just 15-20 minutes from the south entrance to Yosemite National Park was definitely a plus. Recommended for: Age 55+.